If you're looking for a high quality villa with a spacious garden and private swimming pool look no further. Villa Irache is a pleasant 3 bedroom property - ideal for couples and small groups. What's more there is a small pitch and putt green, which is great for everyone to enjoy. The centre of Playa Blanca and the sandy Playa Flamingo Beach are less than 10 minute drive away. Air conditioning/heating in the bedrooms and lounge, a heated pool and WiFi are included. The fantastic outside space coupled with high quality interiors. Plus, Playa Blanca centre is less than 10 minutes' drive away. Bliss! The outside of Villa Irache is spacious and dominated by a swimming pool which is surrounded by artificial grass on 2 sides with ample space to relax on one of the sun loungers. This is the perfect place to soak up the Canarian sunshine. A wooden pergola provides a welcome break from the midday sun and houses the dining table and chairs as well as a small seating area. The brick BBQ is next to it. There is off road parking for your hire car. The pathway leads to the front door. The contemporary lounge is bright and spacious and has a comfortable seating, a coffee table, a flat screen TV and access to the pool area. The well-equipped contemporary kitchen is open plan with a dining area. There is a dining table and chairs for 6 people. 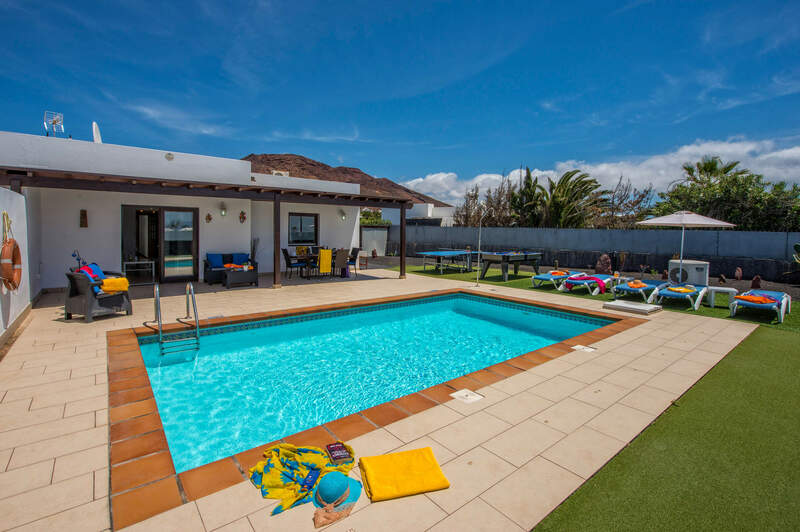 This villa has a double bedroom overlooking pool with an en suite bathroom and 2 twin bedrooms which share the facilities of a separate shower room. Villa Irache is a semi-detached property with our Villa Ramon and located in the lighthouse area of Playa Blanca. It is close to the coast and a little over 5 minutes' drive to the sandy beach of Playa Flamingo with cafe bars and restaurants. The resort centre with plenty of shops, bars and restaurants can be reached within 10 minutes'. Less than 5 minutes' walk away is the coastal promenade running from Faro Park to Los Coloradas which is great for cycling or long walks whilst enjoying the scenery. A selection of shops is a short drive away from the villa . There is a market held every Wednesday and Saturday at Rubicon Marina from 09:00 to 13:00. Here you will find about 30 stalls with crafts, jewellery, arts and books. There is also the big Sunday market at Teguise. The centre of Playa Blanca is within a 10 minute in a car and has a good selection of shops. Alternatively, Rubicon Marina is great for some retail therapy. Villa Irache is a little over 5 minutes' drive from sandy Playa Flamingo Beach and Playa Blanca Beach is 5 minutes' further. If you want to venture even further, the white sandy beaches of Papagayo await you. Totally unspoilt - why not take a picnic, find your own cove and soak up the Canarian sunshine on these natural beaches with volcanic landscape in the background? Rancho Texas Park in Puerto del Carmen is by day an animal and splash park with birds and creatures from all over the world, including white tigers and crocodiles. By night, twice a week, the place comes alive with cowboys and Indians at the country night BBQ with line dancing. A real great fun day or night out for the whole family. Lanzarote's famous Cactus Garden (Jardin de Cactus) is one of the island's biggest attractions all year round and it showcases over 10,000 different plants! The National Park of Timanfaya is also worth a visit. Take the journey through the Lunar route passing some of the largest craters and the valley of tranquillity to fully appreciate the natural energy that has shaped the island. Here you can see demonstrations of the tremendous heat that still lies below the surface. There are 2 golf courses. One in Puerto del Carmen - the newest course - and one in Costa Teguise which is a more established course. Both are 18 holes. Alternatively, there's a pitch and putt course in the Hesperia Hotel in Playa Blanca. Playa Blanca is very popular with anyone wanting to try something more active and hiring bicycles is easy and a popular way of exploring the local area. From the Playa Blanca harbour, you can take a 20 minute ferry to the neighbouring island of Fuerteventura, which is great for a day out. Villa Irache is not available to book for season as it is sold out. Take a look here at the Lanzarote villas that are currently on sale. Villa was beautiful and spotlessly clean. Would definitely visit this villa again. I always book my travel separately and never a package and have stayed at lots of villas. The info in the villa was the best I have ever seen as there was nothing that wasn't covered. Please pass our thanks to the owners and to the cleaners who were lovely. This villa was great! The garden/pool area is just perfect. We greatly enjoyed the table tennis, pool and mini golf on the garden. Great location too, close to shops and restaurants but very quiet area, ideal for some relaxing holidays. Overall we were very impressed with Villa Irache. The location is pretty good, quite close to a small mini market for emergency supplies and very close to coastal walk that links to all the major areas. The villa itself was very nice and had recently been refurbished with a new kitchen and lounge furniture. All the bedrooms and lounge had air con if need and were a good size. The pool and terrace are of the villa were very good (particularly the pool fence), plenty of sunbeds and chairs and lots of safe space for our toddler to entertain himself. Fantastic villa with everything you need. Sea view was a bonus. Lovely villa and facilities, good English channels on tv and wifi worked great. Views across the rear wall to fuertaventura which was lovely! Selection of restaurants and shops 200 meters away with an English owned and run restaurant called the Lighthouse that serves home cooked food. Water park was good for the kids and so too was the pool table, table tennis and pool. Air con worked very well which was needed as the weather was fab!! We very much enjoyed our recent stay at Villa Irache. The villa was very well appointed with everything we needed. There was plenty of towels and both towels and linen were changed regularly. The extras provided (table tennis, pool table, wii console and heated pool) were very much used and appreciated by our children. The outdoor area and barbecue area were lovely and we enjoyed both. An added bonus were the bikes in the shed that our kids used and loved. Thanks to all involved in making our stay so enjoyable. Outstanding accommodation located in a quiet residential area but easily in reach of many local amenities. Extremely clean villa with modern facilities and everything you would need. The wifi was also excellent. Highly recommended all round.